One day in 1995 I was driving home through San Rafael. As I turned from Irwin onto Third Street, an image filled my mind in vivid detail. I knew that I was seeing the ending of a vast, epic science fiction novel. As I continued driving, I heard the words of the first chapter in my head: "When he was nine years old, Garuvel Nep Zimrin discovered that he could disappear." It went on that way as I drove, and I feel lucky that I made it home alive. Where were these words coming from? I'm a writer, but I've never written anything as if by dictation. No book has emerged from my mind as if written by a complete stranger. The words wouldn't stop! That day, after getting to my word processor, I continued writing for fourteen hours. I was merely a secretary, it seemed, for some hidden portion of my psyche. This wasn't good enough. I liked the writing; no, I loved it! But it wasn't mine. Was I planning on taking credit for it after it was finished? I decided to investigate. I used the simplest method at my disposal. I sat on my meditation cushion and put myself into a receptive state. When I had relaxed and felt my mind coming un-moored from its ordinary consciousness, I asked a question: Who are you? "WaldWen," a voice replied. It had a completely physical quality, as if a person stood right next to me and we were having a conversation. The voice was androgynous. I could not tell if it was male or female. Intuition told me that it was both. WaldWen projected an image into my mind. He/She looked like a Buddhist image of Kwan-yin, with a face of feminine beauty and a body of male strength and grace. "Are you a part of me, an alter-ego? Is this some manifestation of Multiple Personality Disorder? Have I lost it? Have I gone cuckoo?" "Yes and no," said WaldWen. "You have made a place for me in yourself where I am comfortable. You are not experiencing a pathological state. You might consider it a gift." "Is this a book that I would write if it were not for your presence?" "You would not write this book, but if you allow me to continue using you as a medium, the experience will cause you no harm. I intend that you participate to a high degree. That is why I've chosen you. I need a writer who can be both skeptical and accepting." "Should I tell people about you?" "First let us write the book. Then we will make decisions about how it will reach the world." 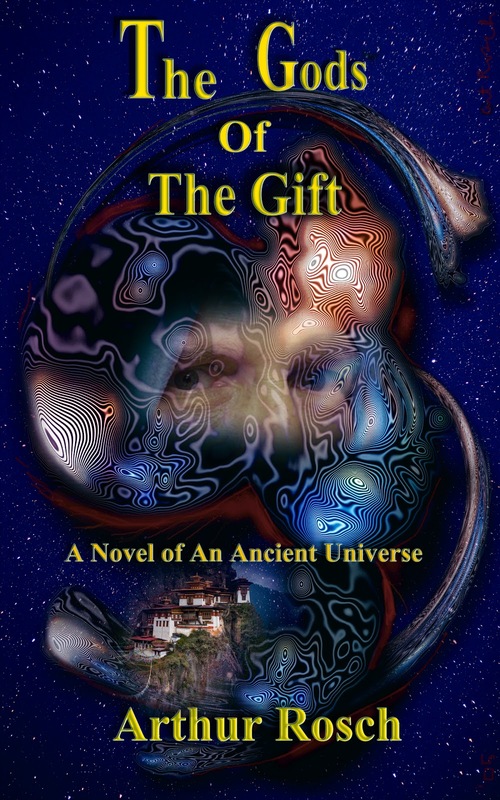 The process of writing THE GODS OF THE GIFT took about fifteen years. I worked on other books and projects. I made music, pursued photography. Then WaldWen would make him/herself known and I would plunge into an altered state where vast portions of writing would come through me. WaldWen provided the structure of the book. Waldwen guided me in the concepts that he/she wanted to convey. Waldwen trained me in the matters about which I was typing. I sat at my computer and typed. I'm a fast typist. The process of writing this book was far different from my ordinary method of producing a novel. It was possible to write several thousand words a day for many days at a time. Then WaldWen would withdraw and I would write nothing of Waldwen's dictation for months and sometimes years. I went back to writing "Confessions Of An Honest Man", "The Shadow Storm", and other projects. I wrote these as any writer writes: with pauses, edits, changes and alterations of plot and character. The writing of THE GODS OF THE GIFT had none of these hesitations. When WaldWen was present, the words came forth and that was that. Today WaldWen paid me a visit. I had not heard from WaldWen in three years. "You can tell the true story," said WaldWen. "You can use my name and your name. The world is ready for the concepts of Noetiphysics. Pure scientists are ready to merge their techniques with artists, engineers and explorers of holotropic drugs such as psylocybin and peyote. It is time for Noetiphysics to emerge as the new method for achieving both spiritual and technological progress. It is time for human beings to become citizens of the Universe." I know that people will mock me, that I risk ridicule by claiming to have channeled this work. I don't care. I'm the book's first and greatest fan. It's funny, deep, weird and very profound. Writer's Digest Award and Review for "Confessions"